Government Adda 247 Bank Job Nabard recruitment NABARD Recruitment 2018 for 62 Posts of Development Assistant. 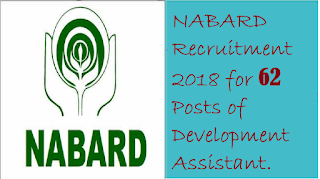 NABARD Recruitment 2018 for 62 Posts of Development Assistant. NABARD विकास सहाय्यक(Development Assistant) पद के 62 रिक्तपदो पर भरती. NABARD 2018 released the notification for the recruitment of Development Assistant, eligible candidates can apply for this posts. 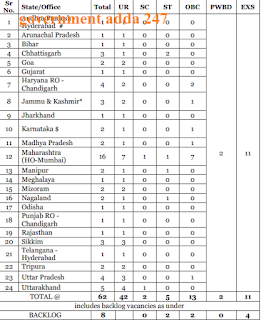 There are total 62 vacancies that released is for Development Assistant this year, as we all know that NABARD is the big organisation every single banking aspirants wants to work with NABARD, this is the big opportunity for those students who are preparing for banking exams. Those aspirants who are studying long have a great opportunity to grabe it. All the eligible candidates are able to apply online till 12th September for Application Form 2018. This year total 62 vacancies are released by NABARD 2018 Recruitment Development Assistant. According to the notification, NABARD Prelims exam will be held in September month (Tentative). आयु सीमा : न्यूनतम: 18 साल, अधिकतम: 35 वर्ष, यानी एक उम्मीदवार का जन्म 02.08.1983 से पहले नहीं हुआ होणा चाहिये और 01.08.2000 से अधिक नहीं (दोनों तिथियां सम्मिलित). ऊपरी आयु सीमा अनुसूचित जाति / अनुसूचित जनजाति 5 साल, अन्य पिछड़ा वर्ग 3 साल, विकलांगों को 10 साल, पूर्व सैनिक को 5 साल. 2018 and no other mode of application will be accepted. specifications as given in this advertisement. II. Signature in CAPITAL LETTERS will NOT be accepted. VI. Keep the necessary details/ documents ready to make Online Payment of the requisite application fee/ intimation charges. VII. Have a valid personal email ID and mobile no. which should be kept active till the completion of this Recruitment Process. Bank may send intimation to download call letters for the Examination etc. through the registered email ID. In case a candidate does not have a valid personal e-mail ID/ mobile number, he/she should create / obtain his/her new email ID and mobile no. before applying on-line and must maintain that email account and mobile number. Candidates to visit the NABARD’s website www.nabard.org – careernotices click on the option "APPLY ONLINE" which will open a new screen. Provisional Registration Number and Password will be generated by the system and displayed on the screen. Candidate should note down the Provisional Registration Number and Password. An Email & SMS indicating the Provisional Registration number and Password will also be sent.